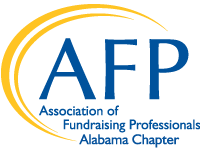 AFP Alabama is pleased to announce the winner of our chapter's 2019 Chamberlain Scholarship: Morgan Hargrove Emahiser, CFRE, and Director of Development at Childcare Resources. The Chamberlain Scholarship is offered annually to each AFP chapter. The scholarship covers the recipient’s conference registration at AFP's annual International Conference and is available to individuals who have never attended an AFP International Conference. Congratulations to Morgan, and thank you to everyone who applied!